-a            All files are listed. -l            Follow symbolic links like directories. -f            Print the full path prefix for each file. -x            Stay on current filesystem only. -L level      Descend only level directories deep. -R            Rerun tree when max dir level reached. -P pattern    List only those files that match the pattern given. -I pattern    Do not list files that match the given pattern. --ignore-case Ignore case when pattern matching. --matchdirs   Include directory names in -P pattern matching. --noreport    Turn off file/directory count at end of tree listing. --charset X   Use charset X for terminal/HTML and indentation line output. -o filename   Output to file instead of stdout. -q            Print non-printable characters as '?'. -N            Print non-printable characters as is. -Q            Quote filenames with double quotes. -s            Print the size in bytes of each file. -h            Print the size in a more human readable way. --si          Like -h, but use in SI units (powers of 1000). -D            Print the date of last modification or (-c) status change. -F            Appends '/', '=', '*', '@', '|' or '>' as per ls -F.
--inodes      Print inode number of each file. --device      Print device ID number to which each file belongs. -v            Sort files alphanumerically by version. -t            Sort files by last modification time. -c            Sort files by last status change time. -r            Reverse the order of the sort. 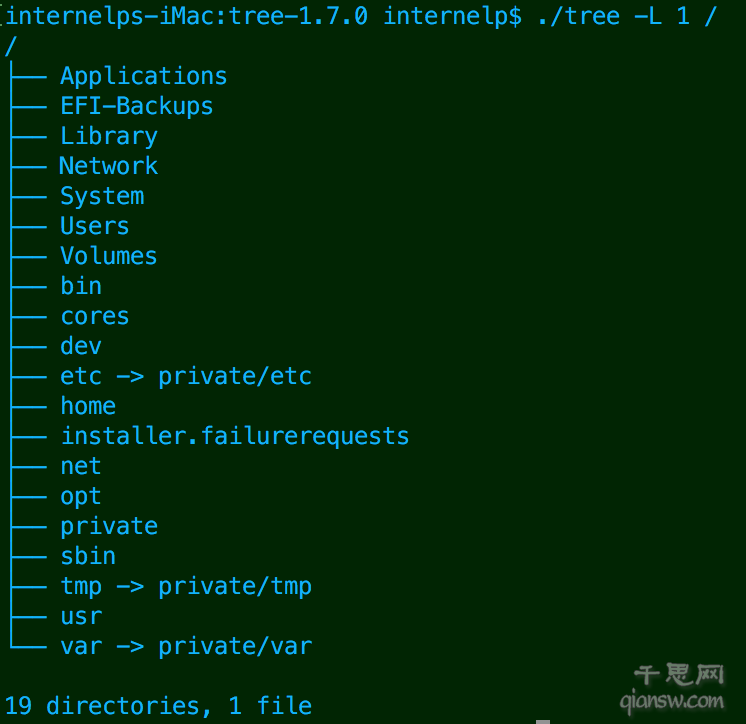 --dirsfirst   List directories before files (-U disables). --sort X      Select sort: name,version,size,mtime,ctime. -i            Don't print indentation lines. -A            Print ANSI lines graphic indentation lines. -S            Print with CP437 (console) graphics indentation lines. -n            Turn colorization off always (-C overrides). -C            Turn colorization on always. -X            Prints out an XML representation of the tree. -J            Prints out an JSON representation of the tree. -H baseHREF   Prints out HTML format with baseHREF as top directory. -T string     Replace the default HTML title and H1 header with string. --nolinks     Turn off hyperlinks in HTML output. --version     Print version and exit. --help        Print usage and this help message and exit.